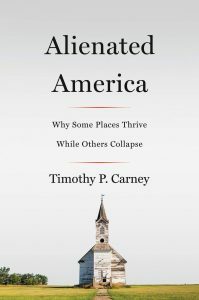 Alienated America, by Washington Examiner editor and journalist Tim Carney, is the latest and most expansive of the “how we got Trump” books. But it’s more than that—it’s a fruitful hybrid of that genre with the broader raft of books probing topics like the disappearance of the middle class, the struggles of the white working class, the retreat of civil society, and the decline of the American Dream. Alienated America is a somewhat lengthy, and occasionally flabby, book. But it is worth a cover-to-cover read. Much will be familiar. There will be either references or obvious allusions to the work of everyone from midcentury conservative Robert Nisbet to contemporary liberal author Arlie Hothschild, along with Robert Putnam, Charles Murray, J. D. Vance, Yuval Levin, Patrick Deneen, and Salena Zito. Alienated America is like a compendium, and expansion, of all the relevant literature. Carney begins by framing Trump’s election as “a referendum on whether or not the American Dream was still alive.” If, like some pundits, you are unwilling to view support for Trump as anything other than revanchist racism, then you will sadly get nothing out of this book. Carney makes a strong case that the reality is much more complicated than the popular anti-Trump narrative. Yet this is no puff piece praising Trump voters, let alone Trump himself. Carney acknowledges upfront that some unsavory social attitudes surely played a role in Trump’s election. But Trump also did best, early in the primaries (when Republicans could choose exactly what kind of Republican they wanted), in struggling, pessimistic places. “Death rates, especially death by suicide and overdose, correlated with Trump’s best counties,” Carney notes. Trump’s worst counties, on the other hand, could be boiled down “to two categories: (1) the highly educated elites [wealthy communities and college towns] and (2) the tight-knit religious communities.” These are places like Arlington County in Virginia and Montgomery County in Maryland, on the one hand, and counties with large Dutch Reformed, Lutheran, and Mormon communities on the other. What connected all these places in their dearth of Trump enthusiasm was their strong communities; for them, the American Dream is not dead. Early on, it becomes clear that Carney has put himself up to a big task. “We will look at many numbers, regarding marriage, suicide, income, employment, and so on,” he writes. “But those numbers are epiphenomena—they are ripples out from what matters.” He avoids the equal and opposite traps of using individual responsibility or economic conditions to explain these social maladies. He instead zeroes in on the diminution of community and civil society as culprits in the alienation of Trump’s America. The Americans dying of overdoses and alcoholism, foregoing marriage and work, leaving the church, and dedicating their lives to video games are mostly neither lazy working-class bums nor repressed bourgeois suburbanites. Working class they may be, but alienation is the malady. Carney does not pretend that these people lack agency, nor does he argue that virtue can be divorced from the actual material circumstances of people’s lives. Virtue is developed socially, in community; strong families are a precondition of community; economic security, community strength, and family formation are all bound up with each other in virtuous cycles. “The skills of the unskilled factory job are the skills of marriage and fatherhood,” he concludes (while the gig economy embodies the same unattached instability as endless casual dating). At times, Carney almost seems to be swinging back and forth between a “black box” view of virtue and family strength and a deterministic, materialistic one. This, one realizes after many pages, is evidence that he is truly grappling with the sheer complexity of the social conditions he is describing. His ultimate conclusion is that civil society—largely facilitated by economic security but independent from it, and possible without it—is the key. In America, the largest and most accessible example of civil society happens to be the church (broadly understood). While the rich can pay their way into civil society—private clubs, paid activities for kids, stable, well-paying jobs that allow regular volunteering—the poor, rural, and working class substantially rely on the church for these social and communitarian benefits, for this private safety net. The “network” of opportunities and relationships that characterize elite neighborhoods is more modestly reproduced in the socially engaged religious congregation. But the secularization of America—driven in part by elite norms (Carney draws on Charles Murray’s “they do not preach what they practice”)—intersects with the economic struggles of rural America, resulting in shuttering churches, decreased attendance, and all of the downstream social consequences. There is nothing woo-woo about this: multiple studies suggest a correlation between religious attendance and various social and economic benefits. Carney explicitly notes that it is the community engendered by an active church, not the religious beliefs themselves, that make the church such an important social institution. (In case anyone wonders, he approvingly cites a mosque and Islamic community center in the same vein). These discussions are the backbone of Alienated America, but there are a few other important nuggets here. The most important is Carney’s treatment of cultural resentment versus economic anxiety in motivating support for Trump. This is only one of several fascinating, illuminating uses of statistics and studies. Carney explains, “Studies of individuals found Trump supporters doing just fine. Studies of places found Trump doing well where people were doing poorly.” In other words, individuals who were doing fairly well in struggling places turned to Trump. (This geographic dynamic is itself a symptom of the increasing classand income-based sorting taking place in America, which is the subject of another long passage.) It is true, of course, that what we call economic and cultural anxiety are inextricably bound up together. But this finding robs Trump haters of an excuse to refuse any sympathy to Trump voters. Another bit worth recounting is Carney’s discussion of marriage, and what he dubs the “Lena Dunham fallacy,” or the stereotype that elite America is a desert of singleless and unattached, uncommitted sexuality. He cites Charles Murray’s research in Coming Apart, which found that while working-class America was succumbing to many of the above-noted maladies, upper-middle class and elite Americans were getting employed, marrying, having kids (in that order), and even attending religious services at surprisingly high rates. In other words, while elite norms have moved away from glorifying marriage and family, it simply will not do to blame the moral and social collapse of middle America on a handful of left-wing entertainers. Finally, there is a brief but gratifying discussion of suburban sprawl as a contributor to the decline of community and civil society. This is a point Robert Putnam has also made, and while suburbanization is not an all-powerful explanation, it is unquestionably a factor. Carney also discusses the concentration of retail and the destruction of many main streets and small, locally owned businesses. Related is the disappearance of what sociologist Ray Oldenburg calls the “third place,” the kind of quirky little community institutions that have been largely written out of our highways-and-strip-malls built environment. A minor stylistic complaint: at times, Carney allows himself to slip into a kind of cheap rhetoric more fitting to Fox News or talk radio. For example, after noting that the racism of some Trump voters should not render their policy preferences anathema, he cites Margaret Sanger as an analogy. Elsewhere, in his chapter on the conflict between government programs and civil society, he repeatedly relies on a forty-year-old quote from then-mayor Bernie Sanders: “I don’t believe in charities.” The likely intent of the quote—that private acts of charity cannot correct structural inequalities—may be false, but it is not really elaborated. Later, Carney concludes that “throwing money at the poor, it turns out, is often adverse to welcoming them into society.” As many social policy wonks would note, the problem is that we throw money at the poor in indirect, socially deleterious ways. The possibility that cash grants and wage subsidies might do the trick, as opposed to the admittedly soul-sucking, paperwork-heavy, adverse-incentive-producing social programs we do offer, is never explored. The book is also so comprehensive that the core focus is sometimes lost. Some arguments—like a long discussion of the Sexual Revolution, and a discourse on the insight that political centralization and atomized individualism are two sides of the same coin, with a reference to Obama’s 2012 “Life of Julia” ad—clearly relate to Carney’s central argument, but the connections are not always made clear. And although Carney has explicitly written a book about American culture, some reference to what is happening in other Western, formerly Christian countries might be helpful. Does secularization do some kind of unique damage to American society? Are there less socially destructive and bureaucratic ways of administering a welfare state? These questions may be for a subsequent volume. Ultimately, though, these flaws are minor. Alienated America does what it sets out to do, and will stand, for awhile anyway, among the best of the popular, journalistic accounts of the Trump phenomenon. Addison Del Mastro is assistant editor of The American Conservative. He tweets at @ad_mastro.